Posted on 19 February 2015 under Education, Gandhi, History. As a child growing up in the 1960s I went to an amazing school. Today, I feel helpless and sad because I’m unable to offer such an education to my son, Anand. “Our childhood was so different. Things have changed beyond recognition,” old timers often moan and groan about the past. Still, my heart is heavy. You may ask what was so different about my school? 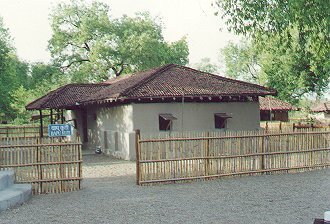 From grades four to nine I studied in a school which followed Gandhi’s Basic Education tenets (Nai Taleem), located at Sevagram ashram in Wardha, founded by Gandhi in the 1930s. Education should not be confined within the four walls of the classroom mugging up boring subjects away from Mother Nature. Gandhiji’s Nai Taleem strongly believed that children learnt best by doing socially useful work in the lap of nature. This is how children’s minds would develop and they would imbibe a variety of useful skills. To implement such a system of education, the great poet and Nobel Prize winner, Rabindranath Tagore, at the behest of Gandhiji sent two brilliant teachers to Sevagram. Mr. Aryanakam came all the way from Sri Lanka and Mrs. Asha Devi from Bengal. This duo combined Gandhi’s educational methodology with Tagore’s love for nature and the arts. My parents, followers and friends of Gandhi, were involved with this educational experiment right from the start. The school tried out many novel experiments in education. Here, I will attempt to recall some of these. Today there is a great deal of talk about conserving nature and wildlife. Our Marathi language teacher Mr. Patil used to conduct his classes sitting on the branch of a jackfruit tree, and regale us with stories about the jungle. He also told us tales about his experiences as a shikari hunting guide. Once by mistake he shot a pregnant doe, but he simply couldn’t bear to see the anguish in her eyes. This hurt him so deeply that he abandoned the gun for good. Later he only shot animals with his camera. Photographing wild animals became his passion and often he spent nights sitting alone in a blind at the top of a tree to take a good shot. The stories he told us showed his deep love and compassion for animals. Listening to his stories was like going into a trance. It seemed as if we ourselves were trudging the jungle trail. Mr. Patil was a wordsmith and could paint word pictures of the jungle. His stories made a deep impression on me and I soon started loving the jungle and its wildlife. Nowadays chapters on animals in Marathi text books usually begin with a drab sentence, ‘Animals are living creatures.’ Will such bland words ever succeed in firing the children’s imagination and inspire them? The school curriculum seems disconnected with the jungle and its wildlife. We did not have to swallow like a bitter pill, as children do now, the couplets of the saint and seventeenth century poet Tukaram (1609-1649). Every monsoon our school hosted a festival of saints. We would write essays, draw pictures, paint murals and enact short plays depicting events from their inspiring lives. Not just a few, but each and every single child participated in this event. For a full fortnight there were festivities in the school. I learnt to recite one couplet by Tukaram in three different ways. During the festival different holy songs were sung. It was in one of these musical choirs that I first learnt to sing the “Bhairavi” raga song to the mother goddess. We learnt many important lessons in a festive atmosphere of play. These included sermons by saints, their history and their contributions to philosophy. There was however, one important difference. All these we learnt in a very playful manner without tags of ‘language’, ‘music’ or ‘philosophy’ attached to them. After many years when I visited a Government School I saw the same couplet by Tukaram, which we had learned in a spirited way, in a fat dreary Marathi textbook. The poet would have felt pained seeing it. In most schools botany is taught through textbooks with good photographs or line drawings or with live specimens stowed away in jars. Children try hard to learn by rote difficult to pronounce botanical names of various species of plants and the different varieties of their leaves and roots. After the exams they soon forget all this jargon. There were a lot of gardens and fields near our school, which boasted a vast variety of plant life. The best part was that our teachers regularly took us for field trips and excursions. On these outings we would closely observe plants. Our first introduction to any plant was by its common name so that we made friends with it. Later we observed its leaves, flowers and fruits more closely. In the end we would pluck fruits and berries and eat them. While eating jujube berries and mangos we would discuss similarities in these fruits. On seeing a drupe (a fleshy fruit with a single hard stone inside) we would note its characteristics. Our daily wanderings in the gardens and fields brought us very close to nature and this helped us understand the fine nuances of botany. The tall theories and intricate principles of botany lay scattered in front of us in all their pristine glory. Our teachers inspired us to touch them, feel them and inspect them minutely. That’s why big words like ‘palmate, divergent and reticulate’ never got the better of me. The reason was simple. The papaya leaf, which these high sounding words described, was right there in front of me. The real, if moot question ought to be: Is there any link between mathematics and real life experiences? I will give an example how I learnt the concept of volume at Sevagram. It was mandatory for us to do manual labour for three hours every day. This was an integral part of our education, and very much a part of Gandhiji’s philosophy of “Bread Labour” where you laboured to grow your own food. It was also part of Vinoba Bhave’s vision of gaining various skills by doing socially productive work. For this I had to go and work in the cowshed for a couple of days. A new cowshed was then under construction. My teacher gave me the job of solving a specific practical problem. “Find the amount of water which a cow drinks in a day. How much water will be needed for all the cows in the cowshed? Then construct a water tank with the capacity to satiate the thirst of all the cows. Find out how many bricks will be required to construct such a tank. Then go and buy that number of bricks.” For over a week I grappled with this mathematical problem. There were numerous tanks with varying sizes. How to measure their volume? What was the relationship between the volume and the outer surface area of a tank? I actually constructed a water tank and in the process learnt a great deal of real life mathematics. Here is another example of learning good science by engaging in useful social work. In our school the students had to take turns to cook. Everyday a hundred people ate in the school mess. The responsibility of cooking was handed to a group of eight people. The expenditure per head per month was announced in advance. The food had to be tasty and nutritious, and the expenses had to be within the stipulated budget. Balancing these disparate requirements was indeed a very tough task! Potatoes were the cheapest but they mainly contained starch and had to be discarded on nutritional grounds. By using the minimal quantity of oil stipulated by the Indian Council of Medical Research (ICMR) we would have exhausted our entire budget on oil itself! None of us had the experience of a good housewife. So we would struggle between food-value and money-value to try and strike a good balance. Many times our food plan and menu turned out to be utterly useless. It was just not possible to cook it. We often miscalculated the time it would take lentils to cook. Then at night while washing a mountain of dishes we felt like wounded soldiers! But in the process of cooking for the community we learnt three very important lessons. These were elements of a nutritious and balanced diet, economics, and the art of cooking. I still remember that coriander green leaves have 10600 units of vitamin A. In just a few days I learnt many valuable lessons working in the community kitchen. Unfortunately, I did not learn any such valuable lessons in the entire decade I spent in medical school. While in school, each child was allocated a small patch of land to grow vegetables. We had to plough, weed, water and grow stuff on our own. There would often be a long line of students at the well wanting to draw water to irrigate their crops. So many children had to water their fields only at night. At night the wail of the jackals would frighten the children no end. But still they would gather courage to go and water their fields. By growing our own fruits and vegetables we learnt the science of agronomy. Before applying any fertilizers we had to study their chemical compositions and for this we often went and had long chats with experienced farmers in our area. These included Mukteshwar Bhai, who studied advanced rice-paddy cultivation in Japan and Prem Bhai, a pioneer in cultivating grapes. Mr. Haveli’s farm was also just a stone’s throw away. He had spent several years in Israel learning advanced agriculture. Often Mr. Anna Bhai Sahasrabuddhey would drop by and enlighten us on emerging techniques and economics of agriculture. In such a dynamic atmosphere we learnt a great deal about agriculture. There was healthy competition amongst the students. We would vie with each other to maximize the yield in our vegetable patch. To increase yields we would add a lot of fertilizers to our crops, which essentially meant pouring bucketsful of cow urine over them. By adopting this novel technique I grew an aubergine with an astounding weight of nearly two kilos. When I went to sell this super-sized vegetable in the Wardha market no one would touch it with a ten-foot pole thinking it had some weird disease! Gandhi’s Nai Taleem methodology is often accused of placing too much emphasis on manual labour, which is considered detrimental to acquiring knowledge. When Basic Education was introduced in the Madras Province people said, “A lot of time is wasted on manual labour, and so our children are lagging behind in their studies.” Because of such accusations the chief minister of Madras, Rajaji had to resign. But what was the truth? People who think children’s minds should be cluttered with unrelated facts so that they could regurgitate them in exams must have certainly found some substance in this allegation. This group believed that if a child cannot list four different ways of making sulphuric acid then his knowledge base was weak. But how will this bunch of facts help a ninth grade child? They are totally unrelated to his life. Nai Taleem students were found better than other children in every field of science, which had a direct bearing on real life. But how did they fare in history, geography, political science and general knowledge when compared to the others? I never learnt geography at school in any formal way, but Sevagram ashram was full of visitors who came from many lands. I used to listen to their stories and from these learnt a great deal about many countries. I was fond of collecting postage stamps and this gave me interesting information about these countries. I read many travel accounts too, and these gave me a good “feel” for foreign lands. This is how I learnt geography. In the ninth grade I also read Sharatchand’s “Pather Daavi” and Jhaverchand Meghani’s novel “Prabhu Padhare”. The graphic descriptions of these novels later inspired me to travel to Burma. For me the subject of geography was totally alive and kicking and not drab and boring. Our teachers also taught us political science and general knowledge in an unusual way. Every evening they would read to us important news items and interesting events from the newspapers, and they would explain the history and politics behind those events. One important news item at that time was America’s reaction to the weapons sent to Cuba by Russia, that there was mutual distrust between America and Russia, and we learned about the significance of the Cuban Revolution. Why is Switzerland called Helvetia? This question confronted me while collecting postal stamps. I read a number of books to find the answer and in the process I learnt a great deal about this beautiful country. Our school was the creative laboratory where several experiments were undertaken to implement Gandhiji’s vision of education and Tagore’s love for the arts. I will illustrate them with a few examples. Apart from the written exams we were also tested in our abilities to cook, write and act in plays, give lectures to a large audience, and write articles. The novelty of the experiment was the flexibility inside the classroom. Every class has some clever and some not so clever students. Children did not have to appear for the same standard examination. This meant that in one single year I could simultaneously pass seventh grade English, ninth grade Mathematics and tenth grade Marathi. Inculcation of good values was an integral part of this education. As part of our daily school activities we lived these values and imbibed respect for manual labour, self-reliance, equality and working for the common good. Apart from these humane values, students also took part in struggles waged in the country for social transformation. For a few days the school was shut and all the students went away to far flung villages in Bihar to take part in Vinoba Bhave’s Bhoodan Movement. Whenever I recount these experiences of my old school days people invariably ask, “Is that school still running? We would like to send our children there.” I would like to share one last detail about my school days at Sevagram ashram. Gandhiji’s vision of village industries did not find favour with the Indian government. Soon small-scale village industries couldn’t compete and lost out to big conglomerates. Because my school had no government recognition it couldn’t last long. In the absence of any recognition, the children’s future hung in doubt. So parents withdrew their children from the school. Many parents who actively participated in the Bhoodan Movement had sent their children to the school. Later, they also withdrew their children. Our government and society failed to appreciate the value of this unique school. Under such hostile circumstances no island of change can survive for long. The harsh and barren social terrain outside the school gobbled it up. Finally, the Bhoodan Movement also withered away. Deep-seated selfishness in society and the race to compete were the death knell of this creative endeavour. I have a deep desire to send my son to such a school. But where is that magic school? EDITOR’S NOTE: Dr. Abhay Bang M.D. (b. 1950) is the son of the economist, Thakurdas Bang, a friend and follower of Gandhi, and one of the leaders of the Sarvodaya Movement after Gandhi’s death. Abhay Bang was raised in the Gandhian ashram of Sevagram, which Gandhi had founded in 1936. He is an Indian community health activist and researcher in Maharashtra, India, where he has revolutionized healthcare for the poor, and has overseen a program that has substantially reduced infant mortality rates in one of the most impoverished areas of the world, work for which he has won many awards. He and his wife, Rani, are recipients of the prestigious Maharashtra Bhushan Award, and have co-authored articles in The Lancet. They were named couple of the year by the Indian edition of Time Magazine in 2005. He is currently the director of the Society for Education, Action and Research in Community Health (SEARCH), which he founded in 1984. This article was translated from Marathi by Arvind Gupta, and is courtesy mkgandhi.org.